That could open the door for more effective individualized medicine, for example providing blueprints of genetic predispositions for specific conditions and diseases, such as cancer, diabetes or addiction. "The hope is that in 10 years people will have all their DNA sequenced and this will lead to personalized, predictive medicine," said Jens Gundlach, a UW physics professor and lead author of a paper describing the new technique published the week of Aug. 16 in the Proceedings of the National Academy of Sciences. The scientists placed the pore in a membrane surrounded by potassium-chloride solution. 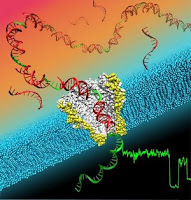 A small voltage was applied to create an ion current flowing through the nanopore, and the current's electrical signature changed depending on the nucleotides traveling through the nanopore. Each of the nucleotides that are the essence of DNA -- cytosine, guanine, adenine and thymine -- produced a distinctive signature. Good! Thanks for the data!